During the week I made up my 5 girder pairs to sit between the 6 piers to make my Cougal Spiral Bridge. I used an approximate 10mm square piece of balsa as a spacer to keep each of the pair of girders an equal distance apart. I did this to each of the 5 girder pairs and ended up with the basic girder shapes that I need before I add all the detail bits (the flanges and webs or whatever they are really called) to make these look like real bridge girders. I used aquadhere to bond the balsa to the styrene. After my thinking last week about filling the piers with plaster to give them some bulk, I decided to go ahead with this concept but went one further. When the plaster was set, I then removed the styrene outer casing and ended up with the plaster piers by themselves for my Cougal Spiral Bridge. On Saturday I cast 5 of the 6 piers in place. I started from the right and named them piers #1 through #6. It turned out that two were just a bit too short - #3 and #4. So I added a mix of very dry plaster manually to the top of pier #3, and used my spatula to blend it in to the existing shape. After drying I used my hobby knife to carve it off flat so the bridge girders could sit nice and square on the pier. Sunday after tending to family commitments in the morning and early afternoon, I cast the 6th pier and set about adding a bit more height to pier #4. Pier #4 was extended the same as I did yesterday to pier #3 with a manual addition of a fairly dry plaster mix to the top of the pier and using the spatula to blend it in to the existing shape. I still need to take the styrene formwork off pier #6. I may do this later tonight. After this I will flatten the top of the pier last few piers and fit the last three bridge girders to the piers. I did try and take a few photos but the camera stopped working. The view screen bit the dust. That was $79 up in smoke! This camera was from Aldi and includes a recharger, two batteries and 2GB SD card in the price. Better get the boss to go out and get another one this week. Pier #6 on the far left still with styrene formwork encasing it and pier #2 on the right. Next week I think I will turn my attention to the bridge on the front track of the spiral. At this stage I have no idea how I will build this. So this week I have gradually started back into the hands on modelling scene after just pottering round with some DCC electronics over the last few weeks. I decided to build a set of bridge piers out of styrene to be used in my model of Cougal Spiral. 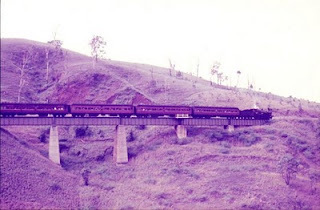 I do have access to a rather old photo of which I have no idea where it came, that shows a train traversing the Cougal Spiral with a 50 Class loco and some old 72' 6" coaches. I previously mentioned that this photo shows that the spans are approximately 70' to 80' in length. My spans work out to be 30'. I was going to buy some Micro Engineering 30' girders after Bob from SCR advised that this was what he had used on his very finely detailed layout, but at this point I will see how some scratch built ones work out. Contrast this photo above taken in the 1950's maybe with one taken in 1988 that I showed a few weeks ago on my blog showing a lot more trees in existance. Isn't nature grand! I have 6 piers built so far, and may add a 7th. This week I will attach the webbing to the girders and try and join the two girders together to create each of the 5 initial spans. I will also put a top on the hollow pier frames and see if I can then file this off to make them a nice smooth structure so that the spans can sit nice and flat on them. I could even pour plaster down the piers to make it a more solid structure, but we will see how things pan out. I may have to build up the scenery around the base of the piers so that the piers sit nice and square and are at the correct height to support the track at a constant grade. So after construction is complete, I will then have to work out how I will paint and weather the piers and girders of the bridge, but that is for another update in the future. Appologies to Bob from SCR for another DCC based post. I quite liked his update last weekend and it gave me and a few mates good laugh. Anyway last Tuesday was a Tuesday Nighter's meeting at my place. Only 4 turned up, but it was a very productive meeting discussing and solving the problems of the world. I showed off my new Mini Panel and showed the guys that I could program it by plugging in my Procab into the plug on the Mini Panel. I then proceeded to stand around with my elbow on hips wobbling my head like an old Paul Hogan Character - Leo Wanker and push the route setting buttons on my schematic panel and nothing happened! What! That can't be right! Hmmm. Must be some power continuity issue. Anyway I dismissed this as something to look at later. Later that night I was showing the system off to a late arrival and pushed the buttons on the schematic panel and then, Bang, Bang, Bang, the points were all firing at 1 second intervals setting the routes into tracks 1 and track 2, etc. Argh! Hey guys it now works! Maybe some times it pays to RTFM. After programming, you need to disconnect the Mini Panel from the cab bus before reconnecting it and then putting the panel into what I would call Operations mode instead of staying in Programming mode - so you can then fire the push buttons. Now it is truely like a bought one. Apart from this nothing else has happened this week. Next week I plan to get stuck back into modelling and have some shed time. Automation - Just Like a Bought One! This afternoon I decided to install my NCE Mini Panel into my CAB bus, and fix it to the layout next to the control panel schematic. That was an easy job. I just put a temporary jumper cable from one UTP to the Mini Panel and re-routed the unplugged cable back to where the Mini Panel has been installed. Luckily the unplugged cable reached. I will pester the guys at work tomorrow to make up a permanent cable the correct length to replace my temporary cable. I have my last length of cat-5 cable left and found a few RJ12's I had lying around, so the guys at work will only take a few minutes to make the cable up. I then decided to plug in the 9 push button wires from my existing control panel schematic into the first 9 connections on the Mini Panel. These were already connected through to my existing DS64's and good old me forgot to number the 9 wires as I unplugged them. It didn't matter as I traced the wires back to the push buttons and they looked correct. I then ran a common connection back to the control panel from the Mini Panel. I did install an on/off switch on the panel to isolate the common if I ever want to do work on the control panel. The NCE DCC system was turned on and the Procab plugged into the Mini Panel. I gave this panel the address of 63. So that was the end of my Mini Panel work. I then set about confirming what addresses I would give my two DS64's. As Acacia Ridge has a Loop Id of 110, the two DS64's were given component id's of 111 and 112. Component id 111, has four accessory addresses on it of 1111, 1112, 1113 and 1114. Compnent id 112 has the four accessory addresses of 1121, 1122, 1123 and 1124. I then used my Procab to set the addresses as per the manual by pushing the relevant buttons and issuing an accessory command. 1111 fired in reverse. 1121 and 1122 has their identitied swapped. If truth be told, 1123 and 1124 are not connected up yet. I will solder them the next time I'm in the shed. So out with the trusty screwdriver and I swapped the two wires for accessory 1111 in the DS64 with component id 111. I retested and all is now fine. In then swapped the wires for accessories 1121 and 1122 in the DS64 with component id 112. I retested this and again all was fine. So the first 6 sets of point can all fire individually by selecting the relevant accessory address. Whoopie! This Tuesday is Tuesday Nighters and it could be at my place. If it is, I may have some time in programming my Mini Panel to issue the accessory commands to throw the required routes from the push buttons on the schematic panel to get all the relevant accessory addresses to throw the correct direction. Now that will be scary if that works first attempt! So far, this setup seems to be working just like a bought one. This will enable running sessions to be such a lot more easier for the drivers entering and leaving Acacia Ridge Yard.